I’ve never really been a cat person; I grew up with dogs and appreciate their ability to learn words and obey commands. A dog is a companion, whereas a cat is an occasional visitor. But plants? How can plants keep you company? Well, ever since I started on the garden here, I’ve been talking to my plants. I welcome them the moment they show their shoots, and say hello to them every morning. I tell them how beautiful they are and how brilliantly they’re doing. When my potatoes poke their dark-green leaves through the soil I say how lovely it is to see them; when tomatoes thrive and grow bushy I give them plenty of praise. There are two reasons why I think this benefits them. First is the obvious: that I am exhaling carbon dioxide in their vicinity so that they can breathe it in. Second – and this is just my opinion – I think it gives me a closer connection to them, which results in me looking after them more effectively and noticing problems early. Just as the more you talk to your dog the more likely you are to notice when they’re off-colour, so it is with plants. But it doesn’t end there. I have a graded system of reward and punishment. I am mildly discouraging towards herb bennett, harshly critical towards dandelions, vitriolic with brambles and ivy, and openly hostile with the current bane of my life, horsetail. 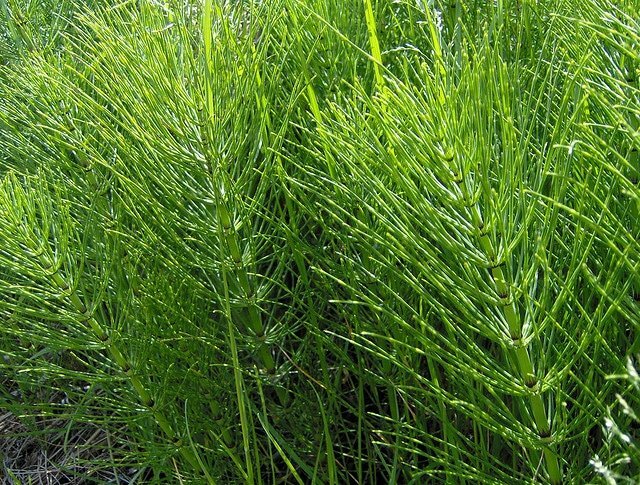 Equisetum arvense, as it is Latinly known, is one of the most ferociously invasive weeds ever. Its roots can go down as far as five feet (yes, five feet!) and are soil-coloured: failure to remove any part of a root, however small, will result in lots of little pony-tails springing up like a miniature forest. Not only that, but instead of flowers these plants have spore-bearing tips which, if disturbed, will scatter tiny spores over a wide area like a giant horsetail sneeze. I’ve read a lot about this, and the advice seems to be, don’t try to dig it out. Pinch or cut off at soil level and keep at it 24/7. If you do this for the next five years you might stand a chance of getting rid of it. Alternatively you can use weed-killer but first you have to crush the plant as it has silica in the stem and so will not absorb it otherwise. And yet in spite of all this I can’t help having a sneaking respect for horsetail. It’s clearly a primeval plant – you can tell that just by looking – and in prehistoric times it was much larger. In fact it was a full-grown tree. It’s kind of interesting, if abhorrent, to see this tiny tree-like thing poking through the soil; and I can’t help respecting its persistence. In addition it has various herbal uses, such as treating urinary incontinence and some kinds of arthritis. I have a little mound of daisies in my “lawn” that I actually trim round; I quite like the flowers, the same with dandelions, although I currently only have a couple of these (I’m waiting for enough to have a crack at making coffee out of the roots). Other than these I have brambles, nettles (which I use some of), sticky-buds, and patch of green leaves that I don’t know what they are but they like the area that will get some grass seed in later this year. I have no interest in digging weeds out, instead I just go round and chop off what I don’t like and hope they take the hint.